This video shows a European Space Agency Ariane rocket that was launched earlier this week. The rocket was carrying two satellites intended for geostationary orbit, the W3B satellite for French company Eutelsat and a satellite for Japanese company B-SAT corporation, called BSAT-3b. There’s lot of information in the clip. The commentator tells viewers about the liquid rocket fuels (hydrogen and oxygen), the water dousing system used at liftoff and explains each stage of the rocket’s journey presentation. 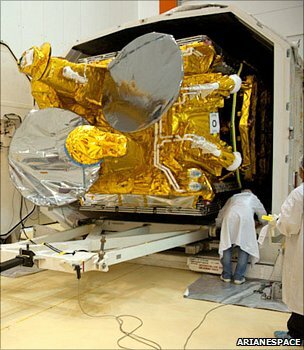 The French W3B satellite was designed to provide TV, radio and internet services to Europe, Africa and the Middle East. At 13:11 in the film, we can see the release of W3B. Notice that the left side of the screen shows an altitude of only 1,200km at this point. This is not high enough to achieve geostationary orbit and the satellite must use its own propulsion system to reach an altitude of 36,oookm. Unfortunately, W3B experienced propulsion problems and was unable to climb to 36,000km. There is a BBC news report of the mission failure here. The photograph in the BBC article is particularly good because, although the satellite is wrapped in protective film, we can clearly see two curved reflectors wrapped in silver film.